Think China 2013 | Day 3 - A Time to Rain and a Time to Learn - who is nicka smith? 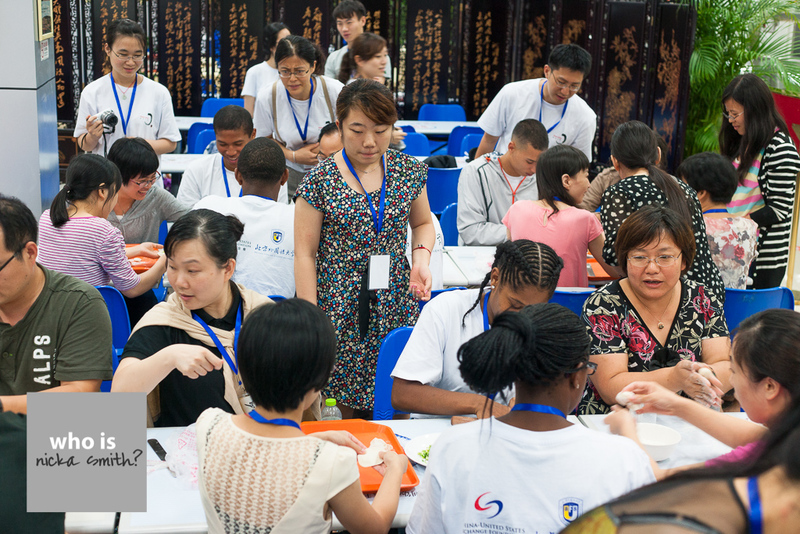 Day 3 of Think China 2013 was filled with lots environmental and academic action. The day began with heavy rain. 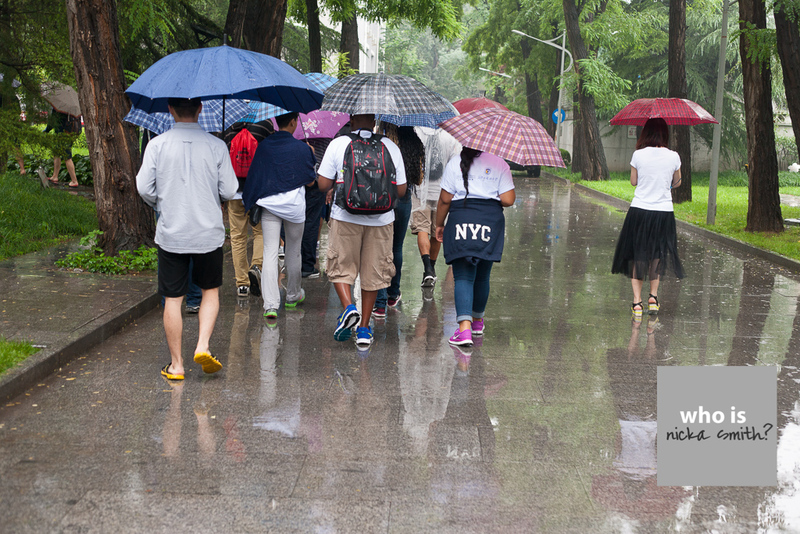 The China United States Exchange Foundation (CUSEF) kindly brought the group trendy umbrellas to brave the walk to their first day of lectures at the fairly large Beijing Foreign Studies University (BFSU) campus. This was the first time the 13 were able to see the streets of Beijing first hand. The streets surrounding the university are full of shops and street vendors; different sounds and smells abound. “I like the weather out here. It was raining and hot [and] that’s how I like my days to go. I also like our shirts and umbrellas! They’re beautiful” said Lakeisha Harris. Once inside, remedy breakfast was served in the university cafeteria. “Me being the person I am, price I decided to eat everything that we were offered which was the fried sunnyside up eggs, a vegetable fried omelet, a pastry with cinnamon on it. Luckily, I finished everything on my plate,” said Marisa Jolivette. Next, a short opening ceremony was held in which a formal welcome was extended by CUSEF and BFSU. The group joined with leadership from both organizations for a photo beneath the custom banner that was made for them. Following the ceremony, the academic portion of the day began. All lectures were taught by professors at BFSU and were chock full of details. They also provided a deeper understanding of the place the 13 will call home for two weeks. Session one was about Chinese history and culture. “China has written records from from 1818 BC, [which] was when it was the Xia Dynasty. Back then, [the] landlord class exploited and oppressed peasants [which] lead to extreme poverty…” said Taylor Wheeler. “The first lecturer said… ’If there is no peace, then there is no development.’ I think that is very true because if people are so concerned about not having peace then we cannot focus on building ourselves up, “ said Kahmaria Adams. The 13 also reflected on many of the other things noted by the first lecturer. “There was a ‘Silk Road’ that connected China to Africa, West Asia, and European countries. That road was used to transport merchandise and Chinese culture,” said Isaiah Mobley. “Some of the culture we learned about in China was that when artist’s paint, they usually have a very absorbent paper and the paint brush would be made out of goat hairs,” said Anthony Gallon. “Something that caught my attention was when the lecturer said that the Chinese emperor’s were called ‘The Son of Heaven,” but they were called that just to fool people. They are supposed to receive charge from heaven to rule the country” said Jordan Williams. “My planned major in college is history, so learning about the 4,000 years of China’s history was very interesting. The in depth overview of the Ming/Tun/Han dynasties and important milestones was something that will stay with me for some time,” said Bryce Bell. The second lecture dealt with politics and relations between China and the United States. It also featured musical and tai chi demonstrations. While everyone attempted some tai chi moves, a few of the 13 took turns trying to play the ancient 7 string fiddle. During the break between the second and third lectures, the group had their first real experience with Chinese restrooms. Many who met with the group prior to the trip spoke about the differences between western bathrooms; Chinese toilets flush with the floor. The third lecture of the day was the first in a series where the 13 learn the Chinese language. “The accents over the letters would determine how the letter would sound…” said Anthony Gallon. The 13 were in for a real treat to cap the day off. The youth were charged with creating the evening’s dinner with members of a group of teachers who were at the college learning English as a second language. “For dinner, we cooked it ourselves!! We made beef/carrot and eggs/green onion dumplings. I’d like to say that I am a professional now at cooking dumplings! They were good and I loved the sides too!” said Taylor Wheeler. 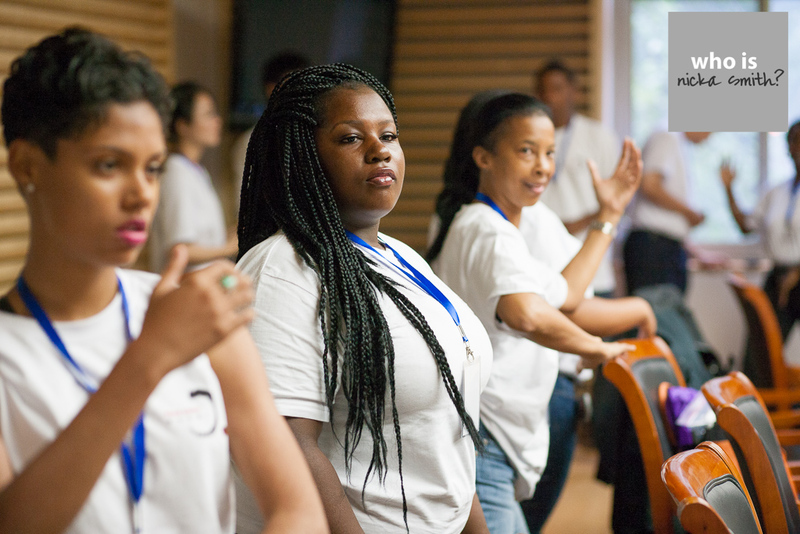 “They were very curious about what we think of Beijing and how the Chinese culture is interpreted in America,” said Ibrahima Mobley. “I am grateful that I got a chance to talk with other people. They were very open and understanding,” said Umiika Rose. In all, day 3 proved to be an excellent experience for the 13. “Something I will remember is to build a relationship with China because their country and ours wants an important and healthy relationship,” said Lakeisha Harris.